Nursery rhymes always seem to provide a wealth of creative ideas for the producers of online slot machines and the story of the three little pigs and the big bad wolf is no exception. Piggy Fortunes is Microgaming‘s take on that tale and if you think you’ve seen something similar before then you’re not mistaken – Quickspin’s Big Bad Wolf is based on the same theme. 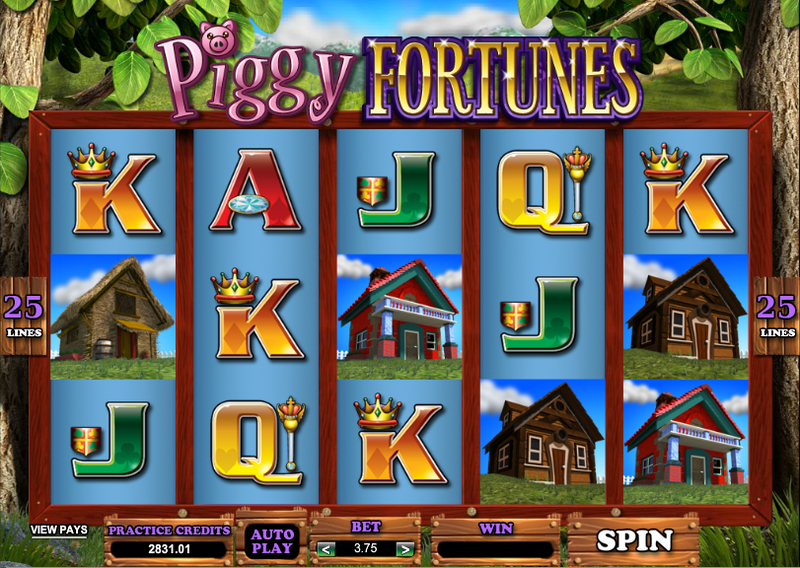 This slot is a five reel and twenty five payline game with one of the most intricate bonus features you’ll see; the basic symbols are the usual J, Q, K and A and the high values are represented by various animals and houses so we have the straw house, the wooden house and the brick house, the three pigs (in one symbol) and the wolf. The wolf is the wild symbol and the pigs are the scatter. To win this feature it’s necessary to land three, four or five of the three pigs scatter symbol; now read on as we try to explain what’s going to happen. A wolf landing next to one of the houses will destroy all buildings of that type – you will now have some wrecked house symbols on the reels. Landing three scatter symbols will rebuild a random wrecked house. The bonus game ends when all houses have been blown down so the more you can rebuild, the longer the round will last. Hopefully that explains it all! You can see on the top right of the screen in the feature which houses have been destroyed and which remain to be blown down. While Piggy Fortunes may not be as graphically impressive as Big Bad Wolf it’s entertaining in different ways. There’s are some twangy banjo, background sound effects which contribute to the overall effect and the bonus game can be a profitable one, even if it’s sometimes over a bit quickly.